The Pittsburgh Pirates enter the weekend trailing the St. Louis Cardinals by 1-game in the standings. I can’t stomach either team winning the division. 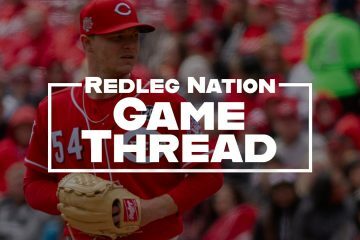 But with all of that said, I want the Reds to play well and win games so the Reds need to try and play the role of spoiler one final weekend and beat the Pirates. It would be bitter sweet if the Reds could somehow take care of the Pirates this weekend much like the Pirates took care of the Reds over the final weekend a season ago. 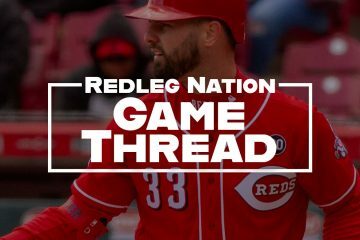 Discuss the game here, Reds fans! That should be plenty of time to build a dynasty. What has Big Bob seen since April 2013 that would give him confidence in Walt? Could not or would not deal for offense. Could not or would not replace injured position players effectively. Its really embarrassing that this team, which has been ready to win since 2010, has been undermined by first a stubborn manager in Dusty, and then a do nothing GM in Walt. I don’t have much faith in the next two years. Wow … Reds just ensured a few more of these kinds of seasons. Worst news of the entire season IMHO. Game is on MLB Network, but it’s the Pirates feed. Pirates @ Reds is being broadcast on MLB television network (regional coverage) Plus all the games on mlb.com t.v. are free this weekend. Go Reds! Late arriving crowd at the old ball orchard tonight, more seats are filled than at the start of the game that’s fer sure. Go Reds! Mike pitched well to get out of that. Would be 2-1 now, minus a Zack Cozart TOOTBLAN. I didn’t think it was a true TOOTBLAN in this case, but my judgement could be completely skewed by the abundance of them this year. That looked like good aggressive baserunning, in an effort to take advantage of their SS in no hurry to retrieve the ball. Did Steve Smith try to stop Mike? He’s gotta go. Addition by subtraction. I heard TV announcer say that he did. Wondering if anyone saw it. He did try. Pirates feed showed it. He’s probably locked for 2+ years. Unbelievable, the Pirates short stop more or less walked over to to pick up the ball that went off his glove and still threw Cozart out at second base. Steve Smith is the absolute worst 3rd base coach in MLB – getting rid of him is the first move the Reds need to make – has no clue whatsoever when to send a runner and when not to – sick of his incompetence ! Leake ran through (thankfully) the stop sign thrown up by the 3rd base coach. I think the players have learned to use their own judgement, rather than trust Smith’s judgement. Steve Smith is the substitute in a tough high school class that NOBODY respects. Pirates or Cardinals to win the NL Central? Man, that’s tough. This series is a win/win, IMO: get swept & screw the Cards (IF they lose 1, or 2, in AZ) OR…take 1, or 2, & screw the Bucs. Can’t lose, either way. True, I just need to focus on the losers instead of the winners. That’s better, thanks. I guess if I had my druthers, I would druther (I don’t think druther is actually a word, but I like the sound of it) see the Reds go out on a winning streak. Go Reds! Agreed. I guess it’s because I just expect the Cards to go deep in the postseason, regardless of how they have to get in, but screwing over the Pirates sure would feel good. GO REDS. The “experts” seem to think the Dodgers are the team to beat in the National League. I hate to say it, but watch out for the Cardinals. They have a history of excelling in the post season. THAT was an impressive throw by Barnhart to get the runner at 2nd. Very impressive. Go Reds! How cool would it be to splice Tucker’s defense with Devin’s offense? On that single by Barnhart, Smith was waving Barnhart around 3rd. Ha. Maybe he should start sending them home on their HR trots. Just to up his average. Knowing Smith he would throw up the stop sign. That new protective hat designed to protect pitchers hasn’t really caught on has it. Villareal in the 8th of a tie game = Price doesn’t want Cardinals to win the Central. Apparently, Jay Bruce doesn’t like them either. Bruce is snakebit every which way. And the beat goes on for Bruce, both, offensively and defensively. I’m not sure what happened with Bruce on that play, unless maybe he was daydreaming out there. Normally he makes that play. keep pitching to Cutch with a base open….why not…we’ve done it all year…burned every time. Game. Good move putting in Villareal. Looking forward to seeing Hoover tonight, as well. And looking forward to seeing more of these decisions from Price for the next two years. BP got his silly hat on. Trying to converse with Cutch. 10 hits, 1 freeking run. Bruce coming up after BP, maybe Jay can atone for that misplayed ball. Go Reds! At least, somewhere, there’s some Cardinals fan, cursing and throwing their remote at the TV. Well, probably not, they’re playing the D-Backs, an even bigger dumpster fire than the 2014 Reds. Methinks they’ll be ok. True, but Alan Trammell was ALSO fired. He just gets to manage the last three games. True. Not a lot of history on that. Very strange. 35,611 turned out for tonight’s titanic struggle, 35,611. I thought that was cool of the fans, at GABP, to still cheer, “BRUUUUUCE” after his last two outs AB. Striking out for the third time ain’t exactly what I would atoning. But I’m sure he had good thoughts, and its the thought that counts, just not on the scoreboard. What a non-clutch catch, lol. That was the Bruce we all know and love on that diving catch. Yeah, and they don’t even have the courtesy to look remotely like Front Row Amy! Now THAT is the straw that breaks the camels back. No Front Row Amy. Off topic, but I love the dugout shot in baseball when you can see the medicine chest opened up: Tums, Pepto-Bismol, Phillips’ Milk of Magnesia, Aspirin, Ibuprofen… basically a first-aid kit for hangovers. Things haven’t really changed all that much in America’s Pastime. I’d say old Jay has repented & atoned. Well played. Another good catch by Bruce, but is he wearing roller skates tonight. Go Reds! Cozart, Barnhart and can we get Jack for the easiest “save” in the history of MLB? Oh well. Sorry Cards. We tried. Really hard. Yeah, and we’re even going to challenge it to prove it. Sorry Price, have you seen the Reds record in games that JJ Hoover has pitched in this year?